Was political failure to compensate deserving victims of the troubles inevitable given the incoherent thinking in the 2006 Victims and Survivors Order? There is a clear consensus abroad in Northern Ireland that the 2006 Victims and Survivors Order No. 2953 (N.I.17) permits the terrorist who takes the life of an innocent member of the public to be deemed as much a “victim” as the unwitting individual he or she kills. The conflation of the innocent and those who terrorised them is achieved through the definition of the term “victim” in section three of the Order. The Order’s approach to the meaning of “victim” is such that it can apply equally to the innocent citizen who finds herself in the vicinity of a bomb, and to the terrorist who planted it. Since the Order’s definition of “victim” is entirely at odds with the meaning of that term (see below), can it be any wonder that the basic issue of addressing the needs of victims remains unresolved years after the Good Friday Agreement? The central argument of this essay draws on the ideas of one of the greatest 20th century philosophers, Ludwig Wittgenstein. Wittgenstein demonstrates that the meaning of a word cannot consist in any verbal or written formulation. Rather, to investigate the meaning of any word, one must look at how it is used in everyday practice. For Wittgenstein, “the meaning of a word is its use in language.” The difficulty with section three of the 2006 Order is that it gives the appearance of establishing (through definition) the meaning of “victim” in the Northern Ireland context. But the meaning of the word “victim” cannot be established via re-definition because meaning resides in human practices and not in definitions. This all-important relation between meaning and use goes beyond physics; it is completely generalizable. For example, the definition of the tort of battery in Black’s Law Dictionary (9th edition) is: “an intentional and offensive touching of another without lawful justification.” The novice law student will quickly realise that legal reasoning does not involve the straightforward application of such textbook definitions or rules to particular cases. Once again, to learn the meaning of the tort of battery one must learn to use “battery” as it is used by experienced legal experts; the practice of law is the repository of meaning. The great American jurist Oliver Wendell Holmes argued that the life of the law is not to be found in definitions; only “experience” gives access to legal meaning. Definitions get their life through the role they play in the practice of the law; divorced from the practice, a definition can determine no course of action. Through experience the novice learns to use the legal term “battery” as more experienced colleagues do. Only through experience can a student learn that legal rules have an intrinsic vagueness or “open texture” (Hart’s The Concept of Law). The meaning of a legal term does not consist in a precisely formulated definition; rather, meaning depends on the way terms are used over time. In his Introduction to Legal Reasoning, Edward H. Levi writes: “It is important that the mechanism of legal reasoning should not be concealed by its pretence. The pretence is that the law is a system of known rules applied by a judge; the pretence has long been under attack. In an important sense, legal rules are never clear, and, if a rule had to be clear before it could be imposed, society would be impossible.” If meaning resided in definitions and rules rather than in the practice of the law (where the emphasis is on use), the pivotal relationship between precedent and all legal deliberation would dissolve away. Because the Order does not use the term “victim” as other people do, the definition of victim in the Order, in effect, contradicts its meaning. Good morning and congratulations on your patience over a long winter. This morning you will receive the results of your child’s transfer test. All of the effort, costs, studying, revision and application cumulate in the mark revealed this morning and all children are to be congratulated regardless of the result. Today is a day of mixed emotions for parents; the elation and relief blended with perhaps some sense of pride and appreciation that your child is soon to be fleetingly venturing out in the journey towards adulthood. Be sure to enjoy the day. Of course with parents a fresh set of anxieties replace the old and thoughts immediately turn to trying to figure out if the mark or grade (grades remove information) will secure a place in the grammar school of choice. Children will naturally be inquisitive and parents keen to answer with accuracy but it will be months before admission decisions are known. Schools will try to be helpful and reassuring but can guarantee nothing absolutely. Some will engage in an intense effort to market and promote their schools even at the cost of misinformation. Political parties are in general officially opposed to academic selection (but privately their representatives choose to use transfer tests for their children) Many will not admit to this lest they lose a vote; those supporting compromise will talk of a single test (combining AQE and GL, not just one exam) but this is a problem they are unwilling to accept they are incapable of reconciling. Education is soon likely to be an issue on your doorstep during the current election campaign. In no other aspect of business would a government be allowed to interfere in the operation of private business. Bill Gates had a very clear message to those who would attempt to steal, duplicate or pirate his Microsoft products. The Department of Education seem to have no such reservations when it comes to meddling in transfer tests. Former DUP First Minister Peter Robinson made much of his determination to deliver a single test. 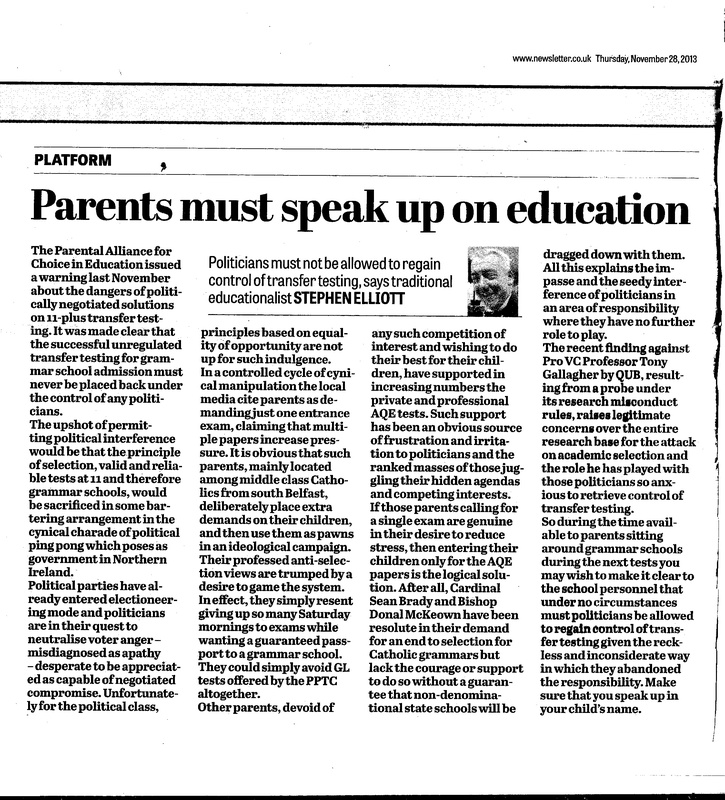 He left office defeated in this aim by the resolve of parents and a dedicated group of principled individuals who will not allow political expediency to destroy parental choice for an education suitable for their individual children. When Arlene Foster became First Minister and the DUP chose the education ministry for the first time it became clear that the DUP were insistent on delivering on the single test goal to satisfy their partners in the Executive. This attitude is difficult to explain since PACE published two letters in the Ballymena Guardian in 2014 outlining very profound concerns over the use of two different tests for the same purpose. No political party or church has had a single word of response. Peter Weir was recently reminded of the warnings but has failed to adopt a leadership position by recommending the superior instrument; the AQE test. The BBC are misinformed since a simple matter of fact checking exposes the inconsistency. One test is developed by AQE the other by GL Assessment. GL Assessment have not been involved in any talks with AQE involving a single test. The PPTC who deliver the test in mainly Catholic grammar schools have no ownership of GL Assessment products. Mr Weir should read the Irish News more carefully. Parents with children transferring to post-primary in 2017-18 should insist that politicians stop interfering in the matter of transfer testing since the Department of Education abandoned their responsibilities nine years ago. Despite the power to do so the DUP Education Minister, Peter Weir, has failed to address his predecessor’s break with United Kingdom parity in respect of academic standards. It appears that the DUPs Yes Minister equivalent of Jim Hacker has been an easy victim of the green Blob’s civil servants in Rathgael House. The green Blob is Northern Ireland’s devolved version of the UK education establishment. Are GCSE and GCE exam results between GB and N. Ireland comparable? The answer regrettably, for the moment, is that it is too early to tell. This action would have allowed Peter Weir to significantly scale down CCEA’s GCSE/GCE functions. Northern Ireland could simply “borrow” papers from larger awarding bodies and make the substantial savings available to hard-pressed schools. Given the achievements of our schools in the recent GCSE and AS/A2 results, it is bizarre they now enter another time of uncertainty while CCEA – who act as their own qualifications regulator– fail to reconcile these two sets of standards. The technical difficulties are considerable; CCEA’s assessments differ in the role given to controlled assessment. The CCEA Regulator is confusing squares and circles. Peter Weir stands in danger of being compared to Jim Hacker for his failure to master his opponents within the green Blob and refusal to act decisively during the first 100 days of a new administration. Now that the majority of pupils and parents have the results of the test(s) in hand it is right that there is time taken to acknowledge the effort, celebrate and relax. If only the media would allow it. Instead the annual circus turns up right on cue. Never let facts get in the way of a good story. T he BBCNI Education correspondent, Robbie Meredith, has prepared a package for today’s local news on the transfer test results. He talks about the Education Minister calling for an end to academic selection – that is not news. Sinn Fein Education Ministers have been trying to end the existence of grammar schools for sixteen years Dr Meredith suggests that non- Catholic grammar schools are mostly controlled – that statement is totally inaccurate and finally he fleetingly mentions the “dualling” schools, ignoring entirely the fact that it is only those schools which require pupils to take multiple tests. Dr Meredith has been informed of the potential misclassification of pupils using the ‘equating’ schemes cited by the “dualling schools” but will not investigate or report on the problem. The schools accepting GL Assessment and or AQE test results without accepting responsibility for the pressure their unnecessary demands cause are: Lagan College, Belfast (not a grammar school), Glenlola Collegiate, Bangor; Campbell College, Belfast; Antrim Grammar, Antrim; Victoria College, Belfast; St Patrick’s Grammar, Downpatrick; Wellington College, Belfast; Hunterhouse College, Belfast. Most politicians would like to see the end of academic selection but will not admit it to you lest they lose your vote, a problem they are evidently incapable of reconciling. Former DUP First Minister Peter Robinson made much of his determination to deliver a single test. He left office defeated by the resolve of parents and a dedicated group of principled individuals who will not allow political expediency to destroy parental choice. The Parental Alliance for Choice in Education welcomes Arlene Foster’s recent statement on education if it is a vow of commitment to her educational vision and not simply a sound bite. Recent comments from her suggest that she would lead a revolution in education. It says something about the effects of fifteen years of Sinn Fein misrule that common sense proposals to return to the traditional values that made our education system admired worldwide seem revolutionary. The promise of positive change at this stage is perhaps necessarily vague. Given her appreciation for the education system in which she grew up, perhaps we can look forward to concrete proposals for protecting the educational heritage currently under direct threat from John O’Dowd and that she will commit her Party to retaining the long-established parity between Northern Ireland’s public examinations and those in England. Why didn’t she give a cast iron guarantee to underprivileged children to remove entirely the Revised Curriculum with its “learning-to-learn” philosophy, proven to be damaging to the achievement of children living in poverty? Why are we continuing to teach these children according to flawed constructivist principles when a longitudinal investigation of the impact of the Enriched Curriculum on disadvantaged children demonstrated that they had fallen significantly behind their peers in traditional classrooms? Why not just remove a curriculum in which the rich were getting richer and the poor poorer? Readers may recall that the CCEA-designed curriculum proposed to raise the reading standards of those children deemed to be not “developmentally ready” by delaying the formal teaching of reading by up to two years! If Arlene Foster were to abandon this ill-conceived curriculum her party could claim – without fear of contradiction – to have removed a significant number of poor children from the “left behind” category. It currently seems that Arlene Foster doesn’t intend to sweep away John O’Dowd’s legacy. This leaves schools under threat, a curriculum in place which leaves the underprivileged child behind and the standards demanded by CCEA examinations (for the first time ever) perceived to be inferior to those in England, breaking parity. Are we to believe that the DUP will advocate the American approach to no child left behind? There can be little doubt that this would indeed amount to an educational revolution. But there’s one among many snags facing Ms Foster. For all its focus on tests, the real emphasis in the American model is teaching. It is a requirement of the policy that instruction be “research-based”. That would mean the inevitable abandonment of the Revised Curriculum and a return to traditional teaching in Northern Ireland. In short, we await further details before deciding if the First Minister’s words are more sound bite than coherent educational vision. 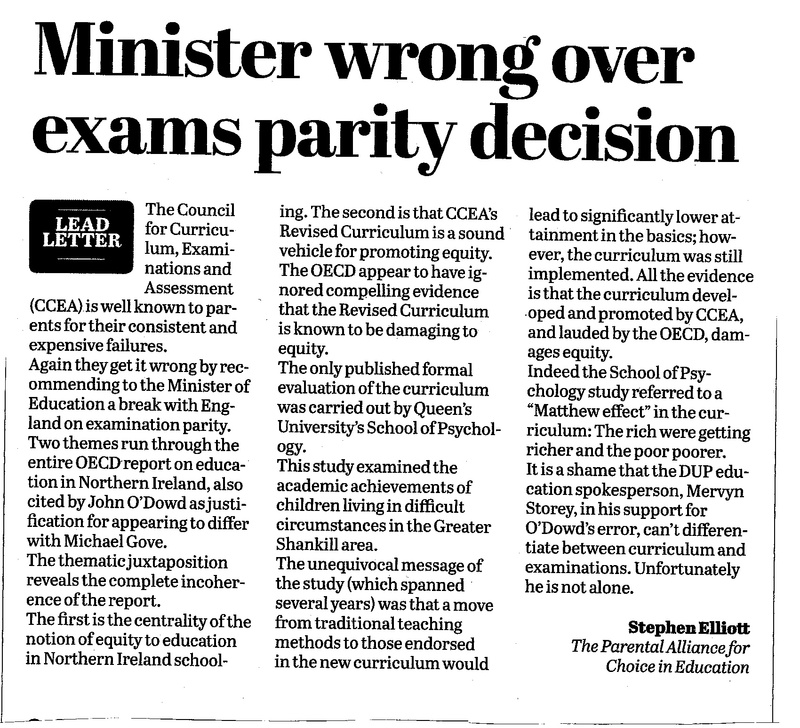 All the evidence is that the curriculum developed and promoted by the Northern Ireland Council for Curriculum, Examinations and Assessment, and lauded by the OECD, damages equity.